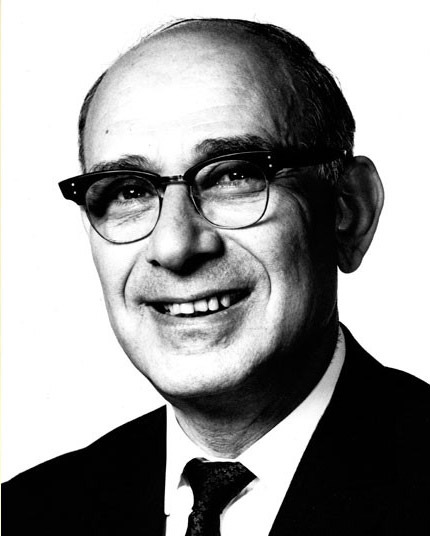 John Yudkin was founder and professor of nutrition in the ​University of London at Queen Elisabeth College. He became famous when he in 1972 published his book - Pure, White and Deadly - where he questioned whether there was any causal link at all between fat and heart disease. After all, he said, we had been eating substances like butter for centuries, while sugar, had, up until the 1850s, been something of a rare treat for most people. "If only a small fraction of what we know about the effects of sugar were to be revealed in relation to any other material used as a food additive," he wrote, "that material would promptly be banned." In 1957 did John Yudkin, in opposition to Ancel Kays and his Lipid Hypothesis, publish his survey "Diet and coronary thrombosis hypothesis and fact" in the medical journal "The Lancet". The report was introduced with the following words: "Much has been written about the role of dietary factors in causing coronary thrombosis. In particular, many believe that the disease is related to the amount of dietary fat, or of a particular sort of fat. In support of these beliefs, we are presented with evidence of an epidemiological nature. We are told, for example, that the higher the average fat-consumption in a country, the higher the mortality due to coronary thrombosis (coronary mortality)." Ancel Keys had access to data from 22 countries, but selected data from only seven countries that matched his Lipid Hypothesis. The 22 countries were in alphabetical order: Australia, Austria, Canada, Chile, Denmark, England & Wales, Finland, France, Germany, Ireland, Israel, Italy, Japan, Mexico, Netherlands, New Zealand, Norway, Portugal, Sri Lanka (then Ceylon), Sweden, Switzerland and United States. Professor Yudkin analyzed data from 15 of the 22 countries Keys had access to: (1) U.S.A., (2) Australia, (3) Canada, (4) Finland, (5) New Zealand, (6) United Kingdom, (7) Denmark, (8) Sweden, (9) Norway, (10) Netherlands, (11) Switzerland, (12) Western Germany, (13) France, (14) Italy, (15) Japan. 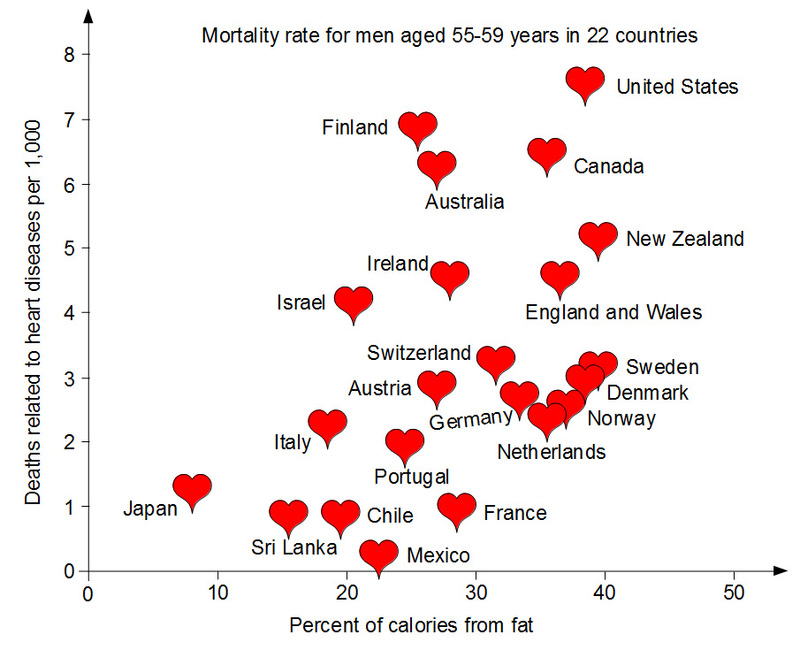 ​On the graphs can you see morality rates in each country in relation to consumption of fats, proteins and sugar. ​Professor Yudkin concluded that "available data on the incidence of coronary deaths and on food consumption makes it difficult to support any theory which supposes a single or major dietary cause of coronary thrombosis." 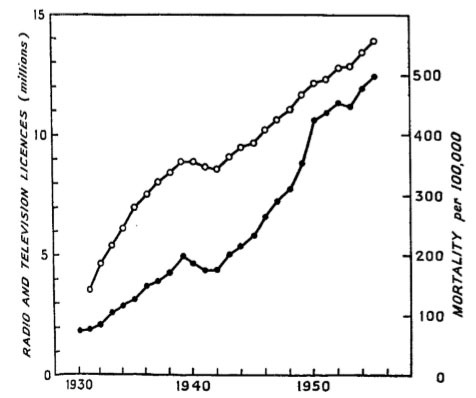 He explained his conclusion in the following way: "The figures for food consumption are averages for whole populations, or large sections of populations. There is almost no information about the distribution of food consumption between these large numbers of people. Let me illustrate this by a hypothetical example. Consider two countries A and B with the same average daily consumption of sugar of 150 g. Let us suppose that in country A some people eat very little and some-a great deal ; we might find that 25% of them ate less than 120 g. and 25% ate more than 180 g. In country B, we may imagine a much more uniform distribution of consumption ; here, only 5% of the people might be eating less than 120 g. and 5% more than 180 g. We shall see later that a plausible hypothesis is that a dietary factor may come into play only when a certain threshold of consumption is exceeded. 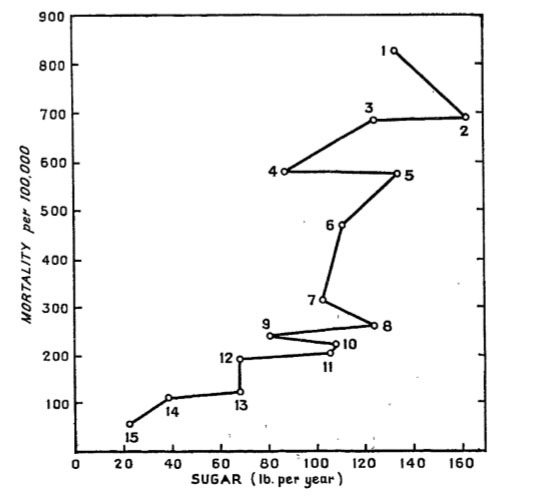 If such a dietary factor were sugar, and the threshold were a daily intake of 180 g., then country A would have a much higher incidence of coronary disease than country B, even though the average daily intake of sugar was 150 g in both." With a typical sense of English humor did professor Yudkin write: "By far the best correlation I have found with trends in coronary mortality is in the number of radio and television licences." Coronary mortality and number of radio and television licences in United Kingdom. ​ - Dr. John Yudkin: "Diet and coronary thrombosis hypothesis and fact." ​ - Wikipedia: John Yudkin. ​ - The Telegraph: "John Yudkin: The man who tried to warn us about sugar".